The latest from the Sk8thing-headed imprint. Sk8thing and Toby Feltwell’s cult-imprint Cav Empt has returned with a range of graphic-heavy pieces for their fifth drop of the brand’s Spring/Summer 2019 Collection. Once again employing the usual aspects of the brand’s bold imagery, the latest drop infuses some beautifully crafted graphics that are once again planted on oversized outerwear and mid-layer pieces. The fifth drop includes an allover graphic-printed and bio-washed Drudgery Zip Jacket, an all red P Knit Zip Cardigan, a teal-colored As Machine Crew Neck — featuring a blue-hued Ziggurat patch detail on the rear, and the Disappearance Crew Neck in Pink – which offers rib detailing and a graphic patch on the rear. Also included in the drop are the paneled Overdye Turtle Neck Long Sleeve tees in both Red and Blue colorways, the sacred Yossarian Pant #2 which employs various zip details, and lastly, the Array Shoulder Bag #1. 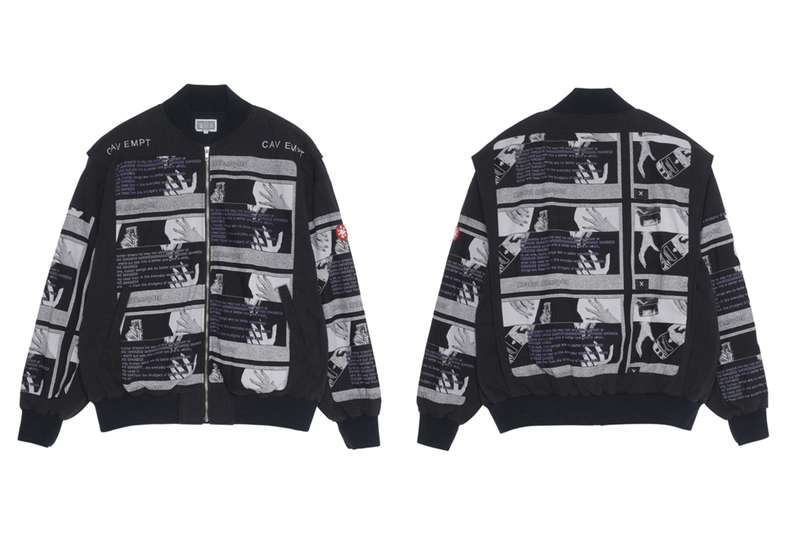 Check out the drop above, and if you’re interested in copping a piece, head over to Cav Empt’s web store. You can expect the range to hit global stockists in the coming weeks. In case you missed it, Vans is honoring Led Zeppelin’s 50th anniversary with a limited-edition capsule. One of the Swoosh’s top hybrid models. A “cultural project” shot in the artist’s hometown. Back to the days of the Swoosh’s waffle outsoles. With Bryan Cranston and Aaron Paul to return. To be worn by James Harden, Damian Lillard and Kyle Lowry. Dave Grohl Compared Billie Eilish to "Nirvana in 1991"